I'm a researcher at the Department of Education. I have a long-term experience in the intersection between design, education, and computer science. My interests are related to learning ecologies, infrastructuring, social innovation, empowerment, and sustainability. I'm specialized in research that is based on practice partnerships, and adopts design-based and participatory methods in such collaborations. I'm head of a research driven design and development unit, EngageLab, at the University of Oslo. Dr. Scient (Informatics) University of Oslo 1999. Work Oriented Objects: Thesis on object oriented modeling related to human activity systems. Theory, concepts, methods and case studies. Cand. Scient (Informatics) University of Oslo 1992. AFF/NHH Solstrand programme for young managers 2009. 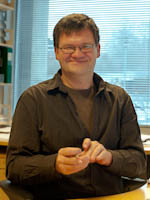 Head of InterMediaLab, InterMedia, University of Oslo, 2003-2012, leading and shaping development and experiment activities within research projects at InterMedia. Strategic design of ICT and video infrastructures and support, budget and personnel management. Scientific Programmer, InterMedia, University of Oslo, 2001-2003. Software Designer and Developer, Birdstep Technology ASA, 2000-2003, lead designer for the product Nomadic Portal, which provide local, personalized services in wireless networks (IP-zones). Scientific Programmer, Department of Informatics, 1997-2001, responsible for development and support of the Multimedia Communications Lab, MMCL. Research Fellow, Department for Informatics, University of Oslo, 1993-1997. I teach at the Communication, Design and Learning field of study. Member of the steering committee and demo/interactive event chair for International conference for Computer Supported Collaborative Learning (CSCL) 2003, member of the steering committee and poster and demonstration chair for European Conference on Object Oriented Programming (ECOOP) 2004, member of the program committee and responsible for the exhibition at Nordic Digital Excellence in Museums (NODEM) 2006, member of the organizing committee for Fourth Nordic Conference on Cultural and Activity Research (ISCAR) 2007, member of the program committee of the International Conference on Computer Supported Education (CSEDU) 2013 and 2015, member of the program committee of NODEM 2014, member of the organizing committee for Nordic Design Research Conference (NORDES) 2009, member of the program committee for NORDES 2011 and 2017. This article reports on a study of a higher education online course based on asynchronous communication. The selection of technology for online discussions aimed at creating a sense of togetherness among the teachers and the students. This choice proved to be a source of insights into the differences of agency of a virtual learning environment (VLE) compared to social media when it comes to social presence. We discuss the agency of Fronter, our formal VLE, and Facebook, when it comes to their effect on the relevant social networks at hand. Important issues identified are related to the quality and nature of the professional and social relations between teachers and students as well as their technology practices in the online course. The discussions are based on the concepts of immediacy and intimacy, as these issues kept appearing in the interviews with the students. The article suggests that the differences of materiality between VLEs and social media, exemplified here by Fronter and Facebook, matter in several respects: how social relations are established and sustained, the agency of the technology in respect to social presence and control and how the technologies affect the quality of dialogic pedagogy. Citizen participation is often a goal of urban development. However, in reality levels of actual participation are often low, limited to certain sets of stakeholders, and the collaboration between them often poor. In engaging with this dilemma, we have established a new research project, Co-constructing city futures (3C), which addresses current challenges to citizen participation in contemporary urban development. The project sets out to encourage and facilitate a shift from processes that intentionally or unintentionally exclude certain groups. Building on ideas about collective learning, it inquires and experiments with public debates and planning processes to enable citizens and other stakeholders to engage in the co-construction of ideas and visions for city futures. Democratic design experiments focusing on green mobility and blue-green infrastructures will be carried out in selected Norwegian cities in collaboration with planners, citizens, and other actors to identify their needs, challenges and interests, and to develop, test and evaluate ideas and prototypes for digital tools that can be applied both in Norway and in other global cities. As a point of departure, we pose three critical questions regarding citizen participation in urban development, with hopes that this can invigorate discussion around this emerging research agenda. The design features of an educational game interact with students’ goals to influence their behaviors, and reciprocally, the outcomes of those behaviors dynamically shape their goals. Our study assessed the process of goal pursuit through a fine-grained analysis of motivation using self reports, interviews, and videos. Findings revealed patterns of engagement and disengagement that reflected students’ self-reported achievement goals of mastering the content knowledge, avoiding looking incompetent, and/or outperforming others. Those goals behaviorally manifested in the choices that students made about which information to focus on and the types of information to seek while playing a game. To inform future development of educational games, we present a typology of information-seeking behaviors and highlight key design features that support and hinder the pursuit of different goals. These insights expand our understanding of the underlying mechanisms that make balancing learner and player experiences challenging and provides guidance for that integration. Making things public challenges existing matters of concern and, in design, may also be about changing them. This paper advances the concept of translation from early ANT literature and explores it in order to support co-designing for making things public. We elaborate on how translations may be understood as moves and transformations of practices and objects that require both time and learning. We discuss how translations may include the emerging, situated, fluid, enacted, experiential and the material, and suggest co-design to rethink translation as a temporal process of learning and ‘becoming’. Our aim is to demonstrate a mutual theoretical influence between ANT and co-design. Our conceptual reflection is based on a museum design case where museum staff and the authors explore new communicational modes of social media. The project established a longitudinal ‘experimental zone’ as space and time for design in the everyday practice of the museum. The paper reflects upon the value of ANT as a framework for rethinking the design–use divide using concepts of learning and translations to bring awareness of co-design as temporal, fluid and emerging processes of becoming. A matter of concern for dialogic institutions such as museums is the struggle to find appropriate ways of integrating social media and digital technologies into dialogues with visitors. This paper addresses how co-creation and experimental methods may be applied in a situated, natural environment, exploring how these technologies may be shaped to support museum visitor relations. The concept ‘experimental zone’ is suggested as a format for a collaborative design space where digital media-based dialogues are explored in line with professional practices. This concept is discussed in relation to two design experiments undertaken in collaboration with the Norwegian Museum of Science and Technology. Jahreie, Cecilie Flo; Arnseth, Hans Christian; Krange, Ingeborg; Smørdal, Ole & Kluge, Anders (2011). Designing for play-based learning of concepts in science – Technological tools for bridging school and science museum contexts. Children, Youth and Environments. ISSN 1546-2250. 21(2) Full text in Research Archive. With the advent of social media, discussions of museum participation have taken a new direction. We explore social media and mobile phones to engage teens in participation during museum visits in the form of co-creation and contribution of content. In an experimental set-up at the Viking Ship Museum in Oslo, we asked a group of 13-year olds to explore and share reflections on issues related to Viking ships with mobile phones and visitor blog. The youths exploration of the exhibition became more engaging with the mobile phone, and we discuss how integration of the blog in the museum visit could have been more related to the teens’ on-going activities outside the museum and how their communication and participation could be fostered through the museum. In this paper we ask to what extent collective cognition can be supported and sustained in classroom practices. One major challenge for learning in technology-rich, collaborative environments is to develop design principles that balance learner exploration with a more goal directed effort. We argue that teachers play a key role in such efforts and that educational wiki designs need to allow such a role in order to support group knowing. First, from an activity theoretical perspective we discuss teaching in knowledge collectives as new type of educational activity. Next, we analyze functions and meta level affordances found in the MediaWiki application. This is followed by a presentation of an intervention study in which the MediaWiki was used by a class of Upper Secondary School learners in Norway. Findings are used to discuss design principles for wikis that support collective cognition and where there is a place for the teacher. Moen, Anne & Smørdal, Ole (2006). Informatics-based Learning Resources for Patients and their Relatives in Recovery, In H-A Park; Peter J. Murray & Connie White Delaney (ed. ), Consumer-Centered Computer-Supported Care for Healthy People. Proceedings of NI2006. Volume 122 Studies in Health Technology and Informatics. IOS Press. ISBN 1-58603-622-X. Consumer health informatics. Smørdal, Ole & Gregory, Judith (2005). KNOWMOBILE: Mobile Opportunities for Medical Students, In A Kukulska-Hulme & J Traxler (ed. ), Mobile Learning: A Handbook for Educators and Trainers. Routledge Mental Health. Chapter 10. Makerspaces are becoming common in science centers and museums targeting youth and adults, but little is known about how these spaces might be designed for supporting younger children’s creativity and knowledge. In this presentation, we report on design-based research involving ​​the university, a science and technology museum, and a kindergarten in Norway, who collaborate to develop and test design concepts for makerspaces targeting 5-6 years old children. The research comprises several phases, including initial ethnographic observations of children playing at their kindergarten and during existing activities at the museum. These observations​ become input to ​design workshops in which the goal is to develop a makerspace activity suitable for but also taking an innovative approach to the needs and motivations of early years education. Using a sociocultural approach, we identify design concepts and analyze the different ways in which the socio-material conditions surrounding the design and implementation of the ​pilot activity support and/or hinder opportunities for learning and creativity. Preliminary findings suggest the prevalence of cultural and historical tensions between the need to provide structure and constraint to facilitate young learner’s participation, and the goal of supporting freedom and creativity. Findings also suggest the importance of developing maker projects spanning across the kindergarten and the science museum, rather than being limited to the latter, and the importance of considering how strong and weak framing approaches structure opportunities for engaging in creative making. Jornet, Alfredo; Arnseth, Hans Christian & Smørdal, Ole (2018). Makerspace-Making. Tensions and opportunities in design-based inquiry across kindergarten and museum..
Jornet, Alfredo; Arnseth, Hans Christian & Smørdal, Ole (2018). Making Collaborating. A Cultural-Historical approach to pedagogical innovation.. I en medieverden der elever møter et mangfold av kilder, alternative fakta, samt sammenblanding av fakta, meninger og begrunnelser, er trening i kritisk tenkning og trening i utforskende læringssamtaler stadig viktigere. http://samtavla.no er en digital tjeneste laget for å hjelpe lærere med å engasjere sine elever i felles læringssamtaler og trene elever i kritisk tenkning. Samtavla.no er en kombinasjon av mikro-blogging og visuell organisering av meldinger på elevenes skjermer. Deltagere kan bruke alle moderne nettlesere, på mobil, nettbrett og PC. Samtavla finnes også i engelsk versjon (talkwall.net) Tjenesten er utviklet som en pilot i forskningsprosjektet DiDiAC (Digitalised Dialogues Across the Curriculum), og prøves nå systematisk ut i 6 skoler i Norge og England, først i en intensiv periode på 6 måneder våren 2017, deretter som en optin studie med flere skoler i 2017-2018. Samtavla er verifisert i forbindelse med et innovasjonsprosjekt ved UiO. Smørdal, Ole (2018). Emerging Concepts for Co-Designing Technology for Dialogic Practices – the case with Talkwall..
Pettersen, Ida Nilstad & Smørdal, Ole (2017). Digital tools for citizen engagement in sustainable urban development: their relevance to the everyday life of citizens and professionals. Pettersen, Ida Nilstad; Smørdal, Ole; Wensaas, Kristina Ebbing & Lopez-Aparicio, Susana (2017). Citizen engagement in mobility-related sustainable urban development: Current practices, challenges and opportunities for change. Samtavla er et verktøy utviklet ved Universitetet i Oslo. Det er basert på mikroblogging og visualisering av samtaler, og kan hjelpe elever til å ha bedre dialoger i klasserommet. Ved hjelp Samtavla kan en lærer formulere et spørsmål eller en utfordring og elevene kan, enkeltvis eller i grupper, sende meldinger til en felles "vegg" (f.eks. på stor skjerm eller projektor). Disse meldingene kan arrangeres interaktivt og ideer kan bli visualisert. Hashtags (#) og et kort meldingsformat (maks 140 tegn) bidrar til å fremme viktige læringsstrategier, som for eksemple å sammenfatte informasjon og identifisere sentrale begreper. Rødnes, Kari Anne; Rasmussen, Ingvill; Ludvigsen, Sten Runar; Smørdal, Ole & Frøytlog, Jo Inge Johansen (2016). Digitalised Dialogues Across the Curriculum (DiDiAC): Design-based interventions for developing 21st-century skills. Smørdal, Ole (2016). Connecting learning across contexts - two design cases. Talkwall is a micro-blogging and visualization tool, at the heart of a new research project being undertaken by University of Oslo and University of Cambridge (2016-2020), targeting secondary school students’ collaboration and critical thinking within three core domains (language, social science and natural science). Schools in Norway and England are taking part. Using a design-based approach, the tool is developed in collaboration with teachers and aims to be a support for teachers who want to promote new forms of classroom dialogue. The seminar invites interaction among the audience, to explore possible uses of Talkwall and its resources for teachers. Smørdal, Ole & Østerud, Svein (2015). An inquiry based writing workshop with iPads in a 4th grade science classroom. With this GPS based iPhone app you can take part in the cultural mapping of your city. Cultural mapping is about observing, describing and sharing our individual and joint understandings of our urban worlds. MAPPA offers ways ‘to write and read the city’ through making and processing collaborative entries on a GPS map. Each entry has a text and a photo linked to a specific place. Tags are also included. Browse the entries and see how the city has been observed and described. You can try the app out with a specific group, with friends or fellow students. Or create your own facebook group and add it as a session in the app. Then invite people to this group to map a special interest or activity. They need to log in via Facebook and select a related group. You might like to use MAPPA to help your community think about and tell stories together. The app was developed by Faster Imaging AS and EngageLab (University of Oslo) for the YOUrban project on social media, design and the city (The Oslo School of Architecture and Design). Multi-touch tabletops have noteworthy and promising affordances for co-composition as an activity in co-located and collaborative learning. In this paper we describe the use of co-composition as a guide in design of a multi-touch application for a museum’s touring two-day workshop on architecture. The goal of the application is to support groups of students (12-13 year olds) when they are creating, selecting, organizing, and presenting digital representations (co-composition) for an architectural workshop project. The goals of the application are discussed in relation to specific features in the user interface that we designed to take advantage of a multi touch approach. We ask how these features relate to co-composition and the pedagogical aims we had for the touring workshop. The features we envisioned would benefit from more well known standards for gestures and user interface components for multi-touch tables. We have found ourselves struggling with the design of digital technology to support scripted collaboration in science education. There are two emergent trends that challenge current understanding of collaborative scripts: One is the merging of real and virtual worlds to produce new environments and visualizations where physical and digital objects co-exist and interact in real time. The other is the merging of embodied experiences from science centres and museums with the activities in the science classroom to produce fun, engaging, and reflective experiences. Further, these environments are inherently social, facilitating dialogue and social exchange. For design of collaborative science learning these trends are challenging, as a network of scripts typically is needed, addressing collaboration, the inquiry process, the epistemological interactions, and the flow of materials that is being consumed and produced. These scripts are inscribed into a range of technologies; such as web-based environments, mobile applications, tangible and physical interfaces, social networks, and spatial, embedded and embodied simulations in immersive learning environments as found in science centres. In this paper we look into a design based research intervention that took place in a Secondary Norwegian school and at the Norwegian Museum of Science and Technology. Based on our experiences we identify a need for new concepts that can increase the awareness in design to the role of scripts in complex environments, and suggest a socio-material and material-semiotic approach that emphasize how scripts are inscribed and entangled in the social and in the material resources, and how they are enacted in epistemological and social activities by students, teachers, and museum educators. En 2 ukers workshop på Norsk Teknisk Museum med mål om å idégenerere, konseptualisere, prototype og brukerteste interaktive museumsinstallasjoner. Rasmussen, Ingvill & Smørdal, Ole (2013). Demonstrasjon: Computer-supported note-sharing to enhance joint sense-making. Stuedahl, Dagny & Smørdal, Ole (2013). Collaboration and Co-design. Tran, Cathy & Smørdal, Ole (2013). Motivated interactions with digital games in a science center. Bakken, Sven Magne; Haavie, Jon; Isdal, Edith; Toussaint, Jeremy; Nesnass, Richard; Krange, Ingeborg; Smørdal, Ole; Jornet, Alfredo; Andersson, Jan Alfred & Tran, Cathy (2012). Varmepumpespill - installasjon i utstillingen EnergiTivoli. Smørdal, Ole & Slotta, Jim (2012). Science Hub: A digital medium for supporting collective science inquiry in hybrid spaces. Stuedahl, Dagny & Smørdal, Ole (2012). Experimental zones – spaces for new forms of participation in museum exhibition development. Stuedahl, Dagny & Smørdal, Ole (2012). Matters of durability, maintenance and continuity in digital intangible heritage. Stuedahl, Dagny & Smørdal, Ole (2012). Studying museums blogs and Facebook activities as platforms for new types of audience relations. Jahreie, Cecilie Flo; Smørdal, Ole & Stuedahl, Dagny (2011). IKT-støttet læring på tvers av skole og museer/vitensentre. Pierroux, Palmyre; Smørdal, Ole & Birkeland, Anne (2011). Designing Learning Technologies for ‘The Budding Researcher’ in a Geological Exhibition. Stuedahl, Dagny & Smørdal, Ole (2011). Re-thinking museum assemblies. Fitzpatrick, Geraldine; Höök, Kristina; Balaam, Madeline; Grönvall, Erik; Moen, Anne; Berthelsen, Olav W. & Smørdal, Ole (2010). Therapeutic Strategies. A Challenge for User Involvement in Design. DAIMI PB. 593. Pierroux, Palmyre & Smørdal, Ole (2010). Designing Learning Trajectories with Interactive Tabletops. Smørdal, Ole & Moen, Anne (2010). Sharing Sensitive Health Matters Online – Design Challenges for Participation and Polyvocality. Smørdal, Ole; Perritano, Anthony John & Sem, Idunn (2010). Multi context, multi representation, multi touch. Weinbrenner, Stefan; Hoppe, Ulrich; Wichmann, Astrid; Bollen, Lars; Weres, Csaba; Desmoulins, Cyrille; Wajeman, Claire; d'Ham, Cédric; Dolonen, Jan Arild & Smørdal, Ole (2009). SCY Basic Ontology for ELOs. Lund, Andreas; Rasmussen, Ingvill & Smørdal, Ole (2009). TWEAK - et prosjekt for kollektiv kunnskapsbygging gjennom bruk av wiki. Moen, Anne; Smørdal, Ole; Sem, Idunn & Drevon, Thomas (2009). RareICT - digital resources for collaborative knowledge construction supporting self-care. Smørdal, Ole; Pierroux, Palmyre & Perritano, Anthony John (2009). Multi-touch tables across contexts. Smørdal, Ole; Raein, Maziar & Hensel, Michael (2009). Exhibition chair for NORDES 2009, Engaging Artefact. Smørdal, Ole; Sem, Idunn & Moen, Anne (2009). Å leve med. Wiki for helsepersonell, pårørende og pasienter med skjeldne diagnoser. Stuedahl, Dagny & Smørdal, Ole (2009). Extending the artefact with digital media - communicating cultural heritage with young users. "What you are looking at is the fifth generation web at InterMedia. This web opens up for a closer relationship between activities within InterMedia, and between us and our partners, colleges and the public. The web is designed as a part of an ongoing long-term research interest in online research dissemination and research communication. This generation is based on an integration of three emergent web-technologies: wikis, blogs and semantic webs. The wiki that empowers this web is developed out of a groupware tradition, with a strong focus on group work, collective awareness, and collective knowledge production. We have moved from content management systems to participatory media, used across projects, clusters and institutionally. This enables us to share the responsibility for communication about research, and providing a more activity-based account of the research. We have been involved in several projects lately with a focus on participatory media, and wikis in particular. We have experimented with and developed solutions for pupils, students and teachers. This web is also a way of practising what we preach. Metadata and labels are used throughout the site, providing a semi-structured database of people, products, projects and relations. This use of semantic tagging allows creation of relationships, aggregations and so forth. The site is powered by Atlassian's Confluence, the wiki is customised with Adaptavist's Theme Builder and is hosted by Contegix. Video streaming is hosted by Influxis. Embedded video streams are made possible by flowplayer." Arkeologer har utfordrende og spennende oppgaver når de leter etter spor fra fortiden, og når de skal prøve å tolke disse sporene slik at de kan gi mening for oss i dag. Vi ønsker å gi deg et lite kikkehull inn i den arkeologiske utgravningsprosessen og la deg føle noe av den spenningen som arkeologene kan oppleve under et utgravningsarbeid. Lund, Andreas; Rasmussen, Ingvill & Smørdal, Ole (2008). Joint designs for working in wikis: a case of practicing across settings and modes of work. Lund, Andreas; Rasmussen, Ingvill & Smørdal, Ole (2008). Joint designs for working in wikis:a case of practicing across settings and modes of work. Lund, Andreas; Rasmussen, Ingvill & Smørdal, Ole (2008). TWEAK as pedagogical and technological co-design for collectively-oriented practices. Pierroux, Palmyre; Rasmussen, Ingvill; Lund, Andreas & Smørdal, Ole (2008). Supporting and Tracking Collective Cognition in Wikis (Symposium). This project develops new designs and models that balance learner exploration and negotiation with more goal directed efforts to bring knowledge advancement more up front in school subjects. To enhance interoperability in the exchange of digital learning resources in different repositories across EU, WP1 in CALIBRATE has developed a curriculum mapping tool called 'Topic Mapper', which enables us to map curricula from one nation/region to another using controlled vocabularies. When national/regional curricula across EU have been mapped to each other, teachers and digital learning resource providers will have tools where they can add metadata tags, which exist in all EU languages, to the learning resource using their own national/regional curriculum. These tags will then be automatically mapped to the curriculum terms used in other countries. Then, if a resource is metadata tagged according to a part in one curriculum (e.g. the Flemish curriculum), it can be discovered and shown in terms of relevant parts in another curriculum (e.g. the Austrian curriculum). Hauge, Trond Eiliv; Dolonen, Jan Arild & Smørdal, Ole (2007). Semantic interoperability of learning resource descriptions based on national curricula. Lund, Andreas; Rasmussen, Ingvill & Smørdal, Ole (2007). Designing a space for teacher interventions in a wiki learning environment. Lund, Andreas; Rasmussen, Ingvill & Smørdal, Ole (2007). Technological Support for Collective Tasks and Activities in a Wiki: Design Ideas and Classroom Realities. Moen, Anne; Sem, Idunn & Smørdal, Ole (2007). ChronICT – learning resources for patient, relatives and health providers dealing with chronic condition. Rasmussen, Ingvill; Lund, Andreas & Smørdal, Ole (2007). Wiki design for teacher interventions in collaborative production. Stuedahl, Dagny & Smørdal, Ole (2007). Use of Blogs for Studying Users' Engagement with Mobile Telephones in Museum Environments. Mifsud, Mary Louise & Smørdal, Ole (2006). Teacher Perception of Handheld Technology: Pedagogical Practices. The landscape of digital cultural heritage documentation and mediation is changing. New digital tools used in research, calls for open access to digitized cultural heritage material, access to research results and processes, as well as changes of the role of cultural institutions challenges design. In this paper the concept of alignment from Actor Network Theory is discussed as an analytical tools for understanding the complexities and negotiations needed for designing for digital cultural heritage mediation. We report from a design case related to the mediation of a cultural historical reconstruction project of a Norwegian Viking boat, building connection between institutional levels and individual research levels using the CIDOC standard. Aminoff, Anna; Toiviainen, Hanna; Moen, Anne; Höynälänmaa, Mikko; Lallimo, Jiri; Smørdal, Ole; Mørch, Anders Irving & Toikka, Seppo (2006). Synthetic report of research and development of professional knowledge practices. KP-Lab deliverable 10.1. Hauge, Trond Eiliv; Øverby, Erlend; Smørdal, Ole & Dolonen, Jan Arild (2006). Mapping National Curricula and Classifying of Learning Resources for Semantic interoperability. Report D1.1 Calibrating eLearning in Schools. Moen, Anne & Smørdal, Ole (2006). Informatics-based Learning Resources for Patients and their Relatives in Recovery. Moen, Anne & Smørdal, Ole (2006). REPARERE; kompletterande informasjons- og mmunikasjonsressursar til hjerteopererte og deira familie. Hjerteposten. Moen, Anne & Smørdal, Ole (2006). REPARERE; web-based resource to support patients and families in CABG recovery. Smørdal, Ole (2006). Exhibition chair for NODEM 06. Moen, Anne; Smørdal, Ole & Gregory, Judith (2005). Learning and construction in trajectories of recovery – new opportunities for multiple actors. Moen, Anne; Nævdal, Jan-Eirik Bakke & Smørdal, Ole (2004). Consideration leading to Design of Learning Resources for Patients and Relatives during Recovery (REPARERE). Moen, Anne; Smørdal, Ole & Gregory, Judith (2004). Designing learning resources for patients and relatives during recovery. Moen, Anne; Smørdal, Ole; Kristiansen, Tove & Refseth, Yngve (2004). Information Sharing in Interdisciplinary Mobile Health Teams. Morrison, Andrew; Skjulstad, Synne & Smørdal, Ole (2004). Choreographing augmented space. Smørdal, Ole; Moen, Anne; Refseth, Yngve; Kristiansen, Tove; Mortensen, Berit Marie & Osnes, Terje Andreas (2004). Participatory design and infrastructures for coordination and communication in interdisciplinary mobile health teams. Stuedahl, Dagny; Smørdal, Ole & Morrison, Andrew (2004). Articulating knowledge from the Vikings to the digital age: designing digital artifacts in research. Moen, Anne; Smørdal, Ole; Kristiansen, Tove; Refseth, Yngve; Mortensen, Berit Marie & Osnes, Terje Andreas (2004). Information Sharing in Interdisciplinary Mobile Health Teams. Groven, Arne-Kristian; Håvard, Hegna & Smørdal, Ole Christian (2003). OO learning, a modeling approach. We report from an on-going project, KNOWMOBILE , that explores how wireless and mobile technologies, in this case how Personal Digital Assistants (PDAs) may be useful in medical education and clinical practice, particularly to access net-based information as needed. KNOWMOBILE is a research collaboration comprising academic and industrial partners including InterMedia, the Department of Informatics and the School of Medicine at University of Oslo, CUT at the University of Umeå, Telenor R & D, Ericsson, Hewlett-Packard, and MedCal. The KNOWMOBILE project aims to support Problem-Based Learning (PBL) and the integration of Evidence Based Medicine (EBM) in the medical education reform in Norway. What does �just-in-time� access to information mean in clinical settings? How can health professionals be helped with access to the most up-to-date medical information? From preliminary analyses of the problematics of PDAs in use - and non-use - we discuss problems regarding information and communication infrastructure that call upon us to work from a social historical interpretation of �infrastructures� in order to better inform design perspectives and directions for future research. We conclude that the PDAs should not be regarded as Personal Digital Assistants, but rather as gateways in complicated webs of interdependent technical and social networks.